This week, we are being sponsored by Ribbon Carousel! Woohoo! I know I'm biased but I LOVE LOVE LOVE Ribbon Carousel! I love my Ribbon Carousel! It's FABULOUS, holds TONS of ribbon. And I love all the beautiful ribbons that are sold in the Ribbon Carousel store! Whoever wins this challenge will get a $10 gift certificate to spend in the store! Woohoo!! Here's my card for this week. I decided to go with a little Echo Park Sunny Days for this card. I used some yummy Orange Sheer Ribbon on the card base and then some fun Orange Divine Twine on the buttons as my "spool elements." Obviously, I used green buttons for the button part of the challenge. 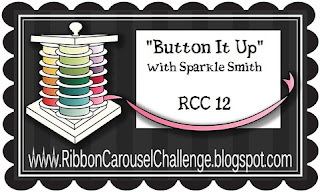 Now go over to the Ribbon Carousel Challenge Blog to see the other designers's awesome creations and link up your projects too! This is so bright and fun! I love the sentiment and your green buttons are the perfect accent! 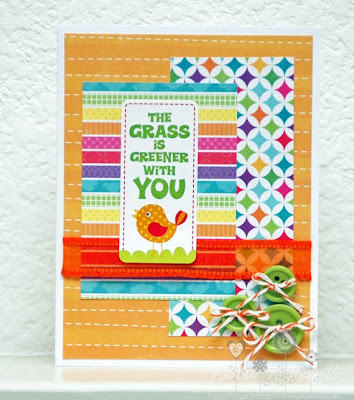 I love the bright and happy colors of this card! So cute and fun!! AWESOME card, Ashley!